Five years ago about this time of year I went home to visit my parents in my childhood home a few miles north of Swansea in South Wales. 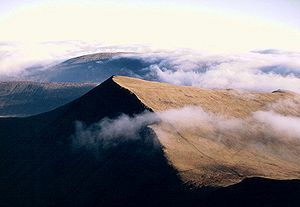 I decided that while there I would like to spend a few days walking and camping alone in the bleakly-beautiful hills and mountains of the Brecon Beacons National Park. I spent the first day hiking through thick fog and endless drizzle, carrying my heavy pack and carefully picking my way through the bogs and rocky cliffs of the barren hills. I had not seen another soul all day except for the ubiquitous Welsh mountain sheep. Wet, cold, exhausted and slightly lost; as dusk fell I decided to camp above the bank of a small stream, below the ridge of a dramatic series of hills known as the Carmarthen Fans. I set up my tent whilst fighting the gusty winds and worsening rain. I started cooking a modest dinner on my little gas stove, the tent whipping about, the soft patting of rain all around and the trickle of the nearby stream. This is when I first heard it. The faint sound of beautiful choral singing, intermittent but distinct and prolonged. Wales is renowned for its male voice choirs and at first I thought I must be hearing a choir practice in a nearby village. However, thinking about it the nearest village was 5 km away the other side of the mountain and a thousand feet below where I was camped. I thought for a while it may be an auditory hallucination, if that was the case it has not happened before or since. The singing lasted on and off for about half an hour, I got up out of my tent to have a look around, all I could see through the growing darkness was the mist. Curious though I was I had no intention of risking injury wandering around the mountains in the gloom and so returned to my tent. Shortly after that the singing ceased and I went to sleep. At the time of this event I was not very spiritually inclined and quite dismissive of any concept of the supernatural. I did not dwell on the event and simply filed it in my mind as curious and unexplained. It was not until a couple of years later I was having a conversation with friends regarding supernatural and strange happening where I related my experience. One of my friends, a long-standing pagan excitedly explained that it was the “sidhe” who are known for their choral singing. It is not until recently that I have looked into this; the “aes sidhe”, pronounced “ays sheeth-uh” is the old Irish Gaelic name for the faerie folk, literally meaning ‘people of the [burial] mounds’. In Irish mythology the aes sidhe were the remnant of the Tuatha De Danann “People of the Goddess Dana” a semi-divine race who retreated to the Otherworld following their defeat by the invading Milesians. In Welsh mythology the faerie folk are called the Tylwyth Teg meaning “the fair folk”, they are said to be the people of Gwyn ap Nudd their king, who is a Welsh god of the dead and the wild hunt equivalent to the Horned God. Unlike the popular image of faeries as tiny and winged the Tylwyth Teg are the size of adults and invariably described as extremely beautiful. Wales abounds with folk tales about faeries and many other magical creatures, however it was not until I started researching this article that I discovered that perhaps the most famous tale of the Tylwyth Teg took place at the spot I camped that night. 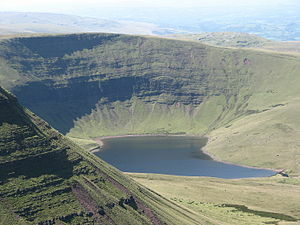 A few hundred meters from my camp site, at the bottom of the hill is a small lake called “Llyn y Fan Fach”, which in English roughly translates as “Lake of the Small Peak”. According to legend one night (possibly New Years Eve – in pagan times this would be Samhain [Halloween]) a local farmer saw the most beautiful woman he had ever seen emerge from the lake. She was a faerie maiden, and upon seeing her the farmer set about trying to woo her with bread and cheese! She was a bit picky regarding the bread but eventually he succeeded and the faerie maiden agreed to marry him, one the condition that if he hit her three times she would leave. She provided a dowry of herds of cattle and sheep which also emerged from the lake. They lived happily until for various reasons he hit her on three separate occasions (in most versions of the tale at a christening, a marriage and a funeral), whence she and her herds returned to the lake never to be seen again. It is said that the children she bore him, who remained with their father grew up to be legendary healers. The imagery is somewhat reminiscent of to the Arthurian legend of the lady of the lake. As is often the case with Welsh legends, which were not recorded until late into the Christian era it is possible that the Faerie Maiden was originally a Welsh Goddess. I cannot rationally explain what I heard that night on the mountains, though I will always remember it. Perhaps I was lucky enough to be in the right place at the right time and to hear the song of Fay.